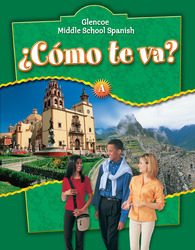 Created specifically for middle school Spanish students, ¿Cómo te va? A, Nivel verde is the second book in the ¿Cómo te va? series. With this exciting program, your students do more than just learn Spanish. They will live it and love it and so will you! A two-year middle school program may begin with ¿Cómo te va? A, Nivel verde. Students move seamlessly from Nivel verde to ¿Cómo te va? B, Nivel azul because Unit 6 of Nivel verde is repeated as Unit 1 of Nivel azul. Students who complete ¿Cómo te va? A, Nivel verde and B, Nivel azul are fully prepared to begin ¡Buen viaje! Level 2.Each unit of ¿Cómo te va? includes required, recommended, and optional materials. The four major language skills, listening, speaking, reading, and writing are supported with abundant opportunities for practicing Spanish in real-life situations. Provide fun opportunities for your middle school students to improve their Spanish language skills with Diversiones—hands-on activities, role-playing, games, interviews, research, cultural readings, and discussion. Involve students in kinesthetic learning with in-text Plegables™ (Foldables™ Study Organizers by Dinah Zike). Organize your resources by unit with TeacherTools Fast File booklets which make it easier for you to plan and to manage your materials. Access any of the program’s print resources with TeacherWorks™ CD-ROM. This CD-ROM includes an interactive lesson planner and the complete Teacher Wraparound Edition. Reinforce language students have learned with in-text songs that were written or selected specifically for ¿Cómo te va? and performed by Justo Lamas. Create comprehensive assessments quickly and easily with ExamView® Pro Testmaker CD-ROM. Aural proficiency is assessed with the Listening Tests CD. Vocabulario: ¡Hablo como un pro!